Dinner Table Balloons – An Innovative Way To Seat Your Guests? There’s a fantastic idea going around at the moment, and we’re so impressed with it that we decided to add it to our services! You see, it all started at Rockbeare Manor, which is located in Exeter, in the heart of Devon. Our client wanted a unique and sophisticated way to identify the tables people would be sitting at, and we managed to come up with a very stylish way of doing so, with the aid of some balloons. But what have we managed to get up to this time? Our luxurious dinner table balloons have been used for a lot of different purposes over the years, but this is one of the more unique ones! By affixing visible numbers onto each balloon, we found that they could be used for marking tables, in a way that is both easy to understand and also unique. Our client, who’s wedding was taking place at the stunning Rockbeare Manor, wanted them at 50cm, as opposed to our standard of 2ft or 3ft, so of course, we obliged and shrunk them down to size. What we love about these balloons is how flexible they are. You can have them at weddings, dinners, balls and even corporate events. Plus, we aim to give clients free reign over how they decorate the balloons. Our client went for a minimalist look in this case, but the intricate designs and complex fonts are well within our capabilities too. 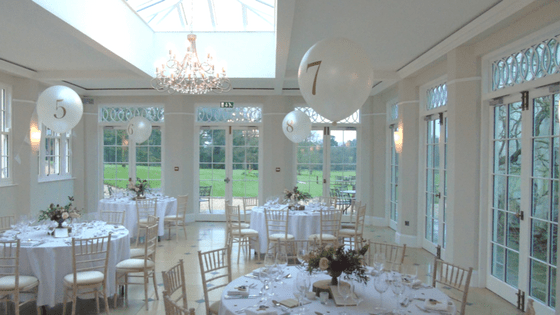 They’re perfect for any situation because some rooms have too high ceilings, others don’t have as much space… it can be hard to match up a generic balloon with your requirements, which is why we strive to provide a personalised luxury service. We hope you’re as excited by the idea of dinner table balloons as we are. For us, there’s nothing better than being able to offer another service to incorporate into the many we already provide. Of course, we have a huge selection of different balloon colours, so there’s something within our selection to suit any wedding theme. As well as this, the numbers are on a vinyl, which can be easily removed for your convenience. Our client wanted to use the balloons for dinner, so it was just a case of peeling off the numbers and repositioning them around the room. While the bows and curls look wasn’t for them, it is something we can offer people, so you can have a luxurious looking balloon highlighting each table. If you wanted proof of the balloon’s longevity, our client reported that they put them out for breakfast the next morning, and they were still as inflated and good looking as the day before. Overall, dinner table balloons are proving to be popular, and we’re so happy that we can offer them to you. They’re a fun and unique way for people to mark out tables, and they’re fully customisable too. Our client was thrilled with them, and we know that you will be too. Because they’re so flexible, they’re great for any situation, making them a fantastic way to decorate and help guests to where they need to be.